Not a promotional box , but better than nothing. Location - Narita International Airport - Terminal 2. Landside. '2.17 Start!' - Served on the 16th! 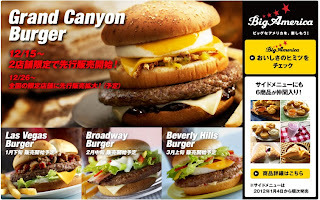 When I wrote the review for the Big America - Las Vegas Burger I was booked and intending on returning to Japan on the 19th of February, so I knew I was going to be able to try the new Broadway Burger during that time. But circumstances arose that I knew I wasn't going to be returning to Japan as planned. I was supposed to depart on the 16th, one day before the Broadway Burger started! I was even taunted the morning before when I visited a Yokohama branch for a coffee, and they gave me a coupon for it! I was flying out of Narita Airport and I took the shuttle from the Hilton to NRT a little earlier than I planned, as I wanted to do some business class lounge hopping. But luckily, Asiana Airlines didn't open their check-in until 2 hours before departure, so I walked around the new Terminal 2 landside mall to kill 30 minutes. As I walked by the McDonald's branch I saw a big sign promoting the burger, and a sticker (which I think was stuck on top of the '2.17' that said 'NOW!') Boy was I happy as I had relegated myself to missing it, and I missed the first Grand Canyon Burger by just a day, as well. All the signage inside the store still said '2.17 Start' so I was a little confused if I could order it or not. The branch airside was not selling the burger yet, so I'm not sure why this one was, or if it constantly breaks street dates on promotional items. It's a pretty new branch, so maybe they'll be hearing from corporate because of this. I even tried to use my coupon from Yokohama, but they couldn't use as their computer wouldn't accept the code, it said it valid from the 17th. I was able to order it at full price. The small branch was packed, and most of the people ordering were using coupons for a Big Mac from some tour agency, it was so busy, most people had to take their trays of food to the benches outside. I think I was the only person who ordered the Broadway Burger. The cream cheese sauce was the same bland sauce as on the Las Vegas Burger, but the pastrami bacon added a needed spice, as I have always said the Japanese beef patty is vastly under-spiced. The mustard sauce, which at first, I feared was a strange relish, actually turned out to be pretty good, and it was a much nicer contrast with the cheese than the sauce that was on the Las Vegas Burger. Though my burger only had one tiny sliver of bell pepper, it worked well on the burger as well. If bell pepper prices in Japan are anything like they are here in Korea, I can understand why McDonald's are a little protective of them. A few more pieces would have been nice as it did work well, I'm hoping my burger was just the unlucky one. 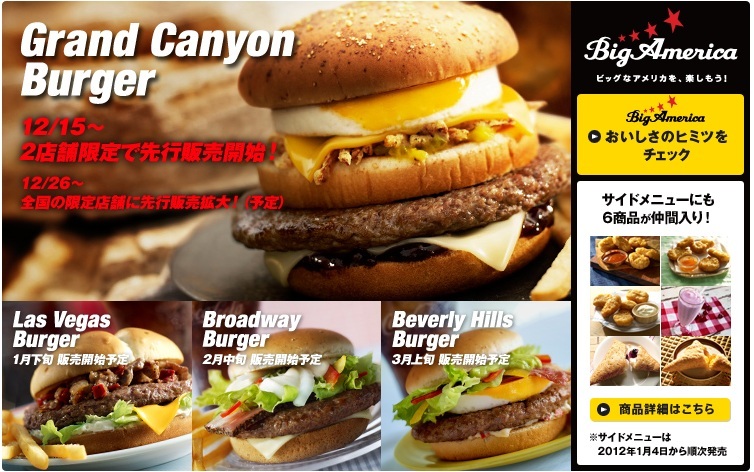 Sadly, I know I won't be in Japan for the final Big America Burger this year, the Beverly Hills Burger. I was hoping to try on of their renditions with an egg, but hopefully next year. 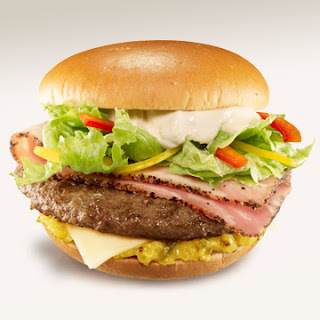 If anyone wants to send me photos of their burger if they can try it, I will happily post it.